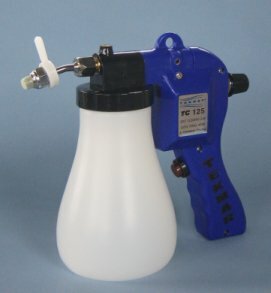 Tekmar TG125 Spot Cleaning Gun - RC Screen Shop & Supply Co.
SKU: TEK-TG125. Categories: Spot Removal, Spot Removal Guns. Tag: spot remover. The TG125 is an affordable gun with deluxe features normally found on guns costing twice as much. Included is a fully adjustable nozzle to allow use on even the most delicate fabrics with virtual ring-proof cleaning. The TG125 is a great gun for removing screen printing smudges and ink marks. It is also great for retail stores for removal of dirt, oil and make up. The TG125 can be equipped with a Direct Feed and an Air Dryer for high speed spot cleaning.